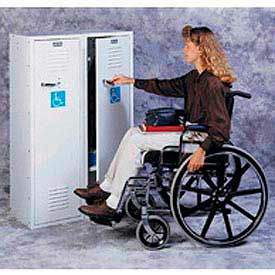 ADA Steel Lockers Are Specifically Designed For Physically Challenged Employees, Patrons and Students. These ADA lockers feature a specially designed chrome-plated door handle that requires only a 20 degree rotation to open door, and then automatically returns to the locked position facilitating door closure with a simple push. These steel lockers are ADA compliant. ADA lockers offer a low profile design for easy access. The handles, hooks and locker bottoms meet ADA requirements. ADA lockers include three single prong side hooks and one double prong ceiling hook. Handles provide space for a padlock or built-in lock (sold separately).